Promoting ethical, responsible, and caring young people is a perennial aim of education. Efforts have been made to find ways of teaching other than traditional ones like games and role play. Narrative-based computer games are engaging learning platforms that allow collaboration of humans and computers in the creation of innovative experiences. In this paper, the authors examine the design of an adaptive, interactive narrative model that uses a student model to provide an individualized story-path and an individualized learning process. In this regard, the authors comprise strong learning objectives underpinned by effective story telling. The adaptive narrative model has been deployed in the educational game environment, AEINS, along with the use of the Socratic Method and pedagogical agents to support teaching in the ethics domain. Evaluation results indicate the usefulness of the design and provide evidence on the development of moral reasoning and the transfer of moral virtues to its users. Computer game worlds have become more complex over the years as computer technology has evolved. It is a very dynamic field that has moved on significantly since the simplicity of Pong with many improvements and expansions. Since the 1950s, computer and cognitive scientists have developed the idea that the computer can be used by a student to learn independently and that computer programs can teach a student. For example, McGrenere (1996) investigated whether games could be utilized to assist learning. Others have explored the appropriate game types and game elements to be used as educational tools (Amory et al., 1999). Some researchers consider educational games only effective if the interaction is monitored and directed by teachers (Klawe, 1998) or if the games are integrated with other more traditional activities such as pencil-and-paper exercises. Other researchers believe that effectiveness is related to the features, preferences and behavior of a particular user (McGrenere, 1996). In the last few decades, games became a strong supplement to teaching by virtue of their concrete experiences leading to learning. 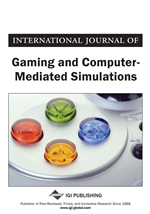 Studies on the use of games in education (Amory et al., 1999; Shaffer, 2005; Gee, 2005; Tan et al., 2005; Gómez-Martín et al., 2005; Fasili & Michalakopoulos, 2005; Egenfeldt-Neilson, 2005; Shaffer, 2006; Gee, 2006) have proven that games constitute a medium that motivates students to try to develop their knowledge while they put it into practice. Instead of being taught about topics, students are engaged with the topics and play them out. Within such environments, players can learn while being engaged in an entertainment activity (Maragos & Grigoriadou, 2005) and thereby create their own experiences and get feedback on their specific actions in a safe environment (Egenfeldt-Neilson, 2005). Of course, not all users share the same preferences or styles when interacting with a game or when solving game-problems. This leads to the importance of adaptation in the sense that the behavior of each play-instance of a game depends on the actions of an individual player. Student modeling plays a central role in providing a personalized learning process for the individual student by considering his needs, strengths and weaknesses. The telling of stories within these environments has an important role in engaging the player, transferring tacit knowledge to the student and supporting adaptation through providing personalized implicit feedback that fosters self reflection and helps the students to discover any course of contradiction themselves. Stories and interactive narrative have been used for a long time now to entertain children and teach them, for example, in classrooms for primary and secondary school curricula, both on their own and as a support for other subjects (Bolton, 1999; Bayon et al., 2003). In an article, Simpson (1998) emphasizes the importance of stories in our lives and their role in tightening human relationships: ``Stories are connections to the past and yet carry us into the future; they speak of relationships, of human connections, and to what gives a quality to our lives.’’ This has been also emphasized through role playing and discussions that have been used effectively in helping students to transfer their knowledge and beliefs into actions, in addition to helping them to see how their decisions affect other people and things (McBrien & Brandt, 1997).